This recipe is a game changer. Have you heard of a one carb waffle before? Essentially it's a waffle....that ONLY HAS ONE DANG CARB IN THE WHOLE WAFFLE! Now, I don't know about you but when I think of waffles I think of big fluffy Belgium waffles that contain gobs and gobs of carbs. So...is it actually possible to make a waffle that only has ONE carb in it...and actually still tastes good?!? Now I have to preface this by saying it's not going to taste EXACTLY like a regular waffle. I mean come on, there is only so much we can do with one carb folks! But it's a super healthy, basic recipe that tastes super indulgent for me after I dress the waffle up with some yummy toppings and definitely satisfies all of my carb cravings. So...how is it possible to make a waffle with so little carbs? One secret ingredient...protein powder! That's right: these waffles are low carb AND high protein. WIN-WIN!!!! The only ingredients you need to make this waffle are one scoop (30 grams) of protein powder, 1/2 teaspoon of baking powder, one egg and water. That's it! 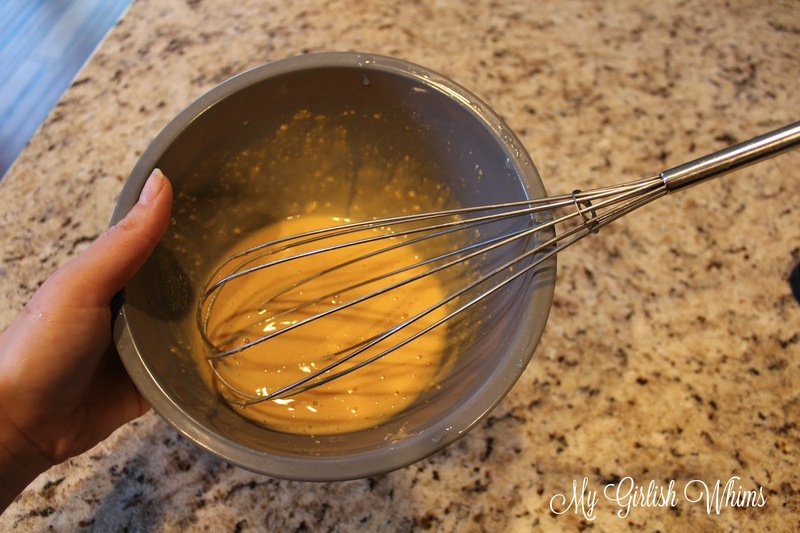 I always combine the protein powder and baking soda first, then the egg, then you just add enough water to consistency and whisk together until combined. Pop it into a waffle maker with some non-stick cooking spray, and after a few minutes you have a waffle! There are protein powders that work better than others for this recipe, and the exact amount of carbs will vary by the protein powder. Technically this recipe pictured features Quest Peanut Butter Protein Powder (affiliate link) that actually has two grams of carbs per serving. I have also made waffles using their Multi-Purpose Protein Powder (check out this savory waffle sandwich recipe!) and that powder only has one carb per serving. Any powder from Quest works well for this recipe as well as any powder from Pescience. I LOVE the Pescience Snickerdoodle Protein Powder: that only has one carb per serving as well. I've made peach waffles using that powder as a base before (so good!!!) 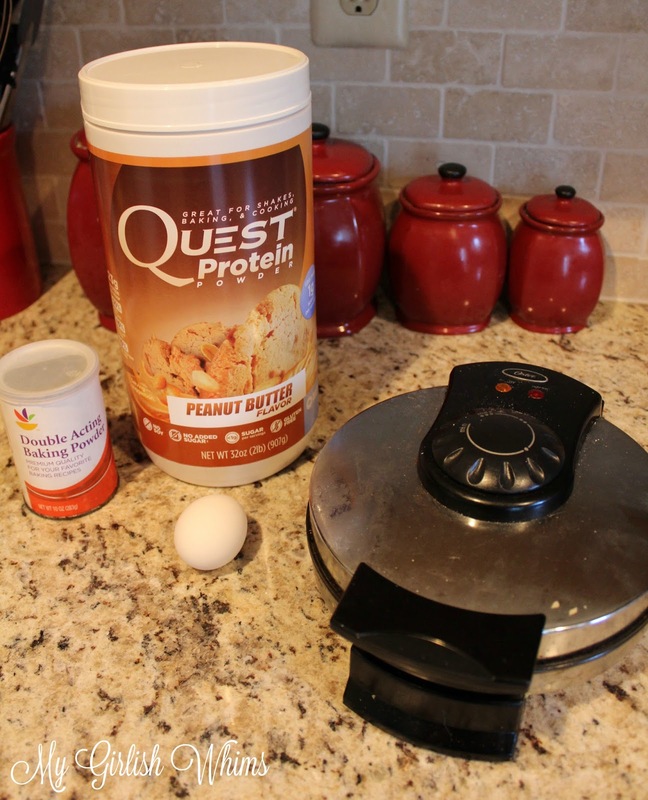 Both Quest and Pescience are a whey and casin based protein powder which make them a good powder for baking/cooking with. The BEST part about making a one carb waffle??? ADDING TOPPINGS! Since the base is so healthy you can add fun toppings and still have a super healthy breakfast! I follow a very high protein diet plan and the waffle pictured below is one of my FAVORITE breakfasts to make that is high protein, low carb and tastes amazing! I like to mix 9g of pb2 powdered peanut butter with 6g of sugar free pudding mix and water to create a peanut butter spread that I first spread on the waffle. I then mix another 9g of pb2 and 6g of pudding mix to 150g of plain greek yogurt and spread that on top of the pb2. 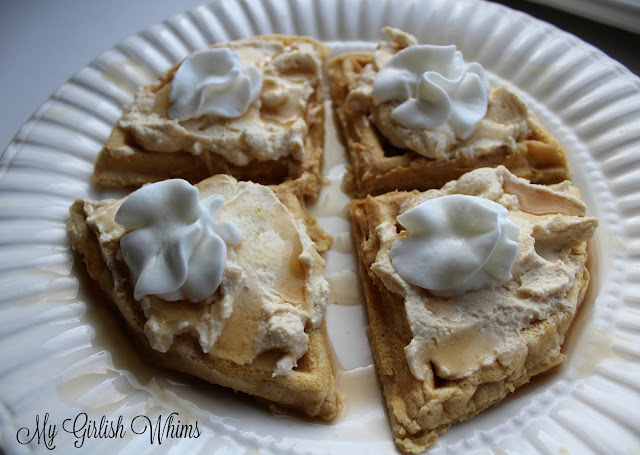 Add a drizzle of sugar free syrup and a few dollops of fat free Reddi Whip and I have an AMAZING peanut butter flavored waffle that LOOKS and tastes super indulgent but is actually only about 390 calories and has over 50g of protein in the whole meal!!!! 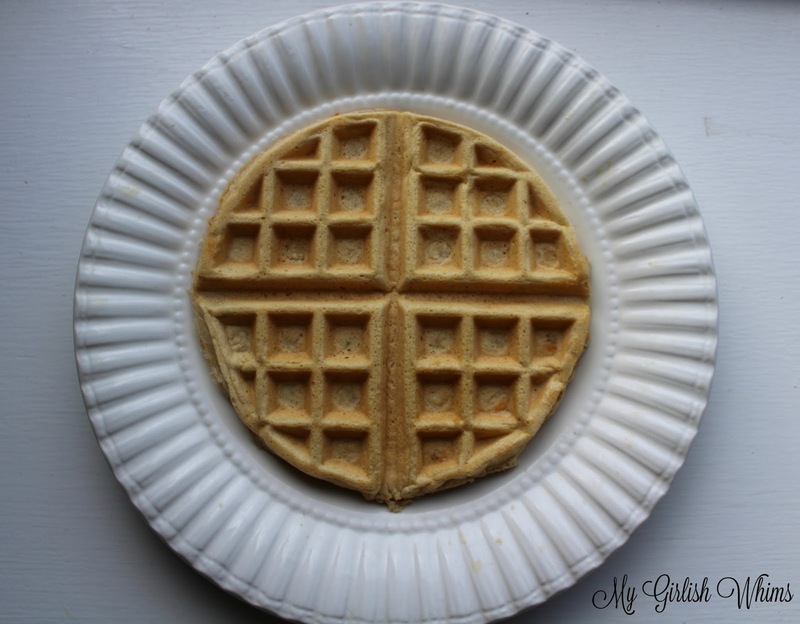 A healthy waffle that is high protein and SUPER low carb! Mix together protein powder and baking powderWisk in one large eggAdd enough water to consistencyPour batter into a pre-heated waffle maker sprayed with non-stick sprayWaffle should be done in about 5 minutes or when ready light shows on your waffle maker! Great recipe! Easy to follow! Thank you, thank you!loved it! These look delicious! Have you tried freezing them? I would love to be able to prep a big batch on Sundays to eat throughout the week. This was great! I added about 1/4 cup of canned pumpkin with some cinnamon for a pumpkin spice flavor. Will definitely be making this recipe a lot! My bad! User error, LOL. I was able to print the recipe. Sorry. I love this - I can't believe I've never tried this recipe! I'll have to try this soon. Made this today with a quest cinnamon crunch packet and it came out so good. I’m loving how easy this recipe is, thank you! I just made this for the first time and it was outstanding! I was shocked at how big and fluffy it was. My one complaint is that it was slightly dry. Any recommendations to add some moisture to the batter? Thanks! try pumpkin, greek yogurt or apple sauce. Oil will work as well, but will add extra calories. 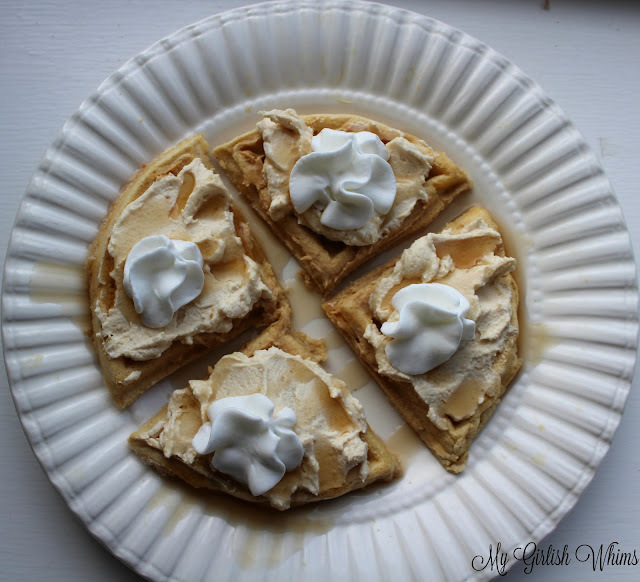 I cannot wait to unpack my waffle maker for this recipe! I made this and it was super dry. Any suggestions? its a protein waffle, so it won't taste exactly like a regular waffle. You can try doing half protein powder, half flour (will add carbs) or adding some greek yogurt, apple sauce or pumpkin for a lighter substitute for oil. I made this for breakfast....delish!! crispy edges, light texture, 100% delicious....what's not to love? thanks for sharing!